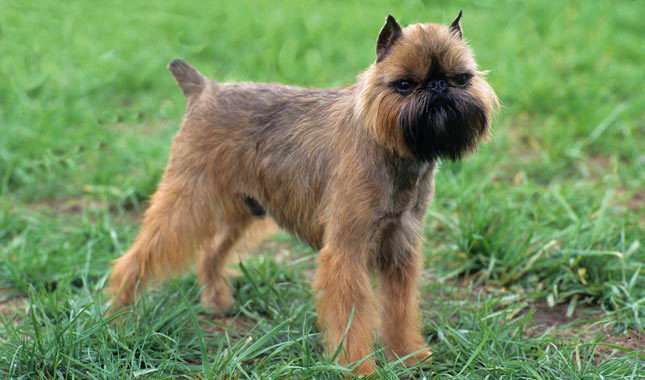 Affenpinscher is a true terrier in spirit. Affenpinschers are generally quiet but may be spunky and fearless in the face of aggression. 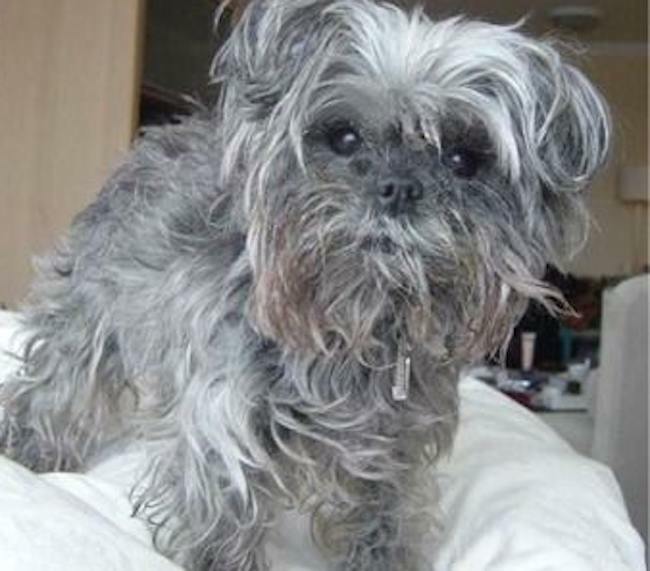 General Appearance: The Affenpinscher is a balanced little wiry haired-like toy dog whose intelligence and demeanor makes it a good house pet. Originating in Germany, where the name Affenpinscher means “monkey-like terrier”, the breed was developed to rid the kitchens, granaries and stables of rodents. In France the breed is described as the “diablotin moustachu” or the moustached little devil. Both these names help to describe the appearance and attitude of this delightful breed. 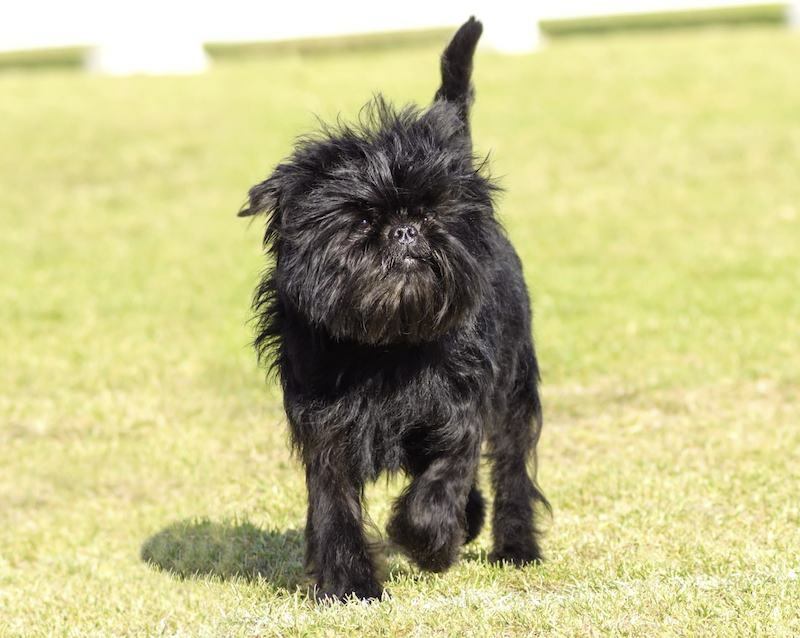 When evaluating the breed, the total overall appearance of the Affenpinscher is more important than any individual characteristic. 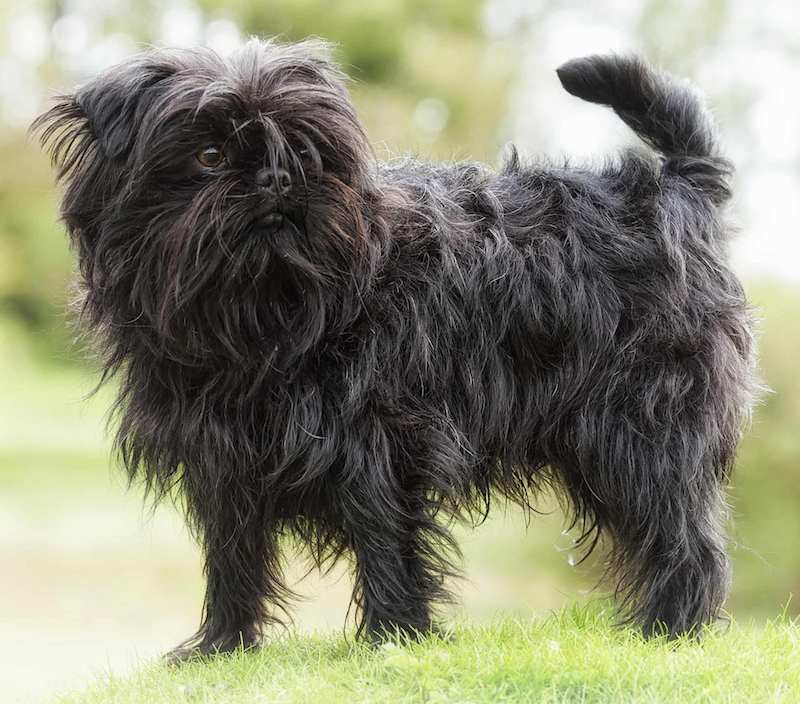 Temperament: The general demeanor of the Affenpinscher is game, alert and inquisitive with great loyalty and affection toward its master and friends. The breed is generally quiet but can become vehemently excited when threatened or attacked and is fearless toward any aggressor. Substance, Size, Proportion: The Affenpinscher is a sturdy, compact little dog with medium bone and is not delicate in any way. The height at the withers is between 9 inches and 11-1/2 inches, with 10-1/4 inches being the ideal. The height at the withers is approximately the same as the length of the body from the point of the shoulder to the point of the buttocks giving a square appearance. The female may be slightly longer. Head: The head is in proportion to the body, carried confidently upright with a monkey-like facial expression. Eyes: Full, round, dark, brilliant, and of medium size in proportion to the head but not bulging or protruding. The eye rims are black. Ears: Either cropped to a point, set high and standing erect, or natural, standing erect, semi-erect or dropped. All types of ears, if symmetrical, are acceptable as long as the monkey-like expression is maintained. Skull: Round and domed but not coarse. Stop: Well defined. Muzzle: Short and narrowing slightly to a blunt nose. The length of the muzzle is approximately the same as the distance between the eyes. Nose: Not obviously turned up or down, with black pigmentation. Lips: Black in color with the lower lip more prominent. Bite: Undershot with the lower teeth closing closely in front of the upper teeth. A level bite is acceptable if the monkey-like expression is maintained. The teeth and tongue do not show when the mouth is closed. The lower jaw is broad enough for the lower teeth to be straight and even. Neck, Topline and Body: Neck: Short and straight with upright carriage. Topline: Straight and level. Body: The chest is rather broad and deep; the ribs are moderately sprung. The underline is slightly tucked up at the loin. The back is short and straight. The loin is short and only slightly tucked. The croup has just a perceptible curve before the tail. The tail is either docked or left natural. When docked the tail is generally between 1 inch and 3 inches long; set high and carried erect. When natural the tail is carried curved gently up over the back while moving. The type of tail is not a major consideration. Forequarters: The front angulation is moderate. Shoulders: With moderate layback and flexible enough to allow free front action. The lengths of the upper arm and the forearm are about equal. Elbows: Close to the body. Front Legs: Straight when viewed from the front. Front Pasterns: Relatively short and straight. Dewclaws: Generally removed. Feet: Small, round and compact with black pads and nails. Hindquarters: The rear angulation is moderate. Hind Legs: Straight when viewed from behind. When viewed from the side they are set under the body to maintain a square appearance. The lengths of the upper thigh and the second thigh are about equal. Stifle: Moderate angulation. Hock Joint: Moderate angulation; straight when viewed from behind. Rear Pasterns: Short and straight. Dewclaws: Generally removed. Feet: Small, round and compact with black pads and nails. Coat: The hair is dense, rough, harsh textured and approximately 1 inch in length on the shoulders, body and back, but may be shorter on the rear and tail in contrast to the longer, shaggier and less harsh hair on the head, neck, chest, stomach and legs. At maturity the neck and chest coat may grow longer to form a cape. The longer hair on the head, eyebrows and beard stands off and frames the face to emphasize the monkey-like expression. The hair on the ears is usually cut very short. The correct coat needs little grooming to blend the shorter hair into the longer hair to maintain a neat but shaggy appearance. Color: Black, grey/silver, or black and tan – with symmetrical markings, or red varying from a brownish red to an orangey tan. Some blacks may have a rusty cast or have white or silver hairs mixed in the coat and furnishings. Some reds have black, brown, and/or white hairs mixed in the coat with tan furnishings. With the various colors, the furnishings may be a bit lighter and some may have black masks. A small white spot or fine line of white hairs on the chest is not penalized, but large white patches are undesirable. Color is not a major consideration. 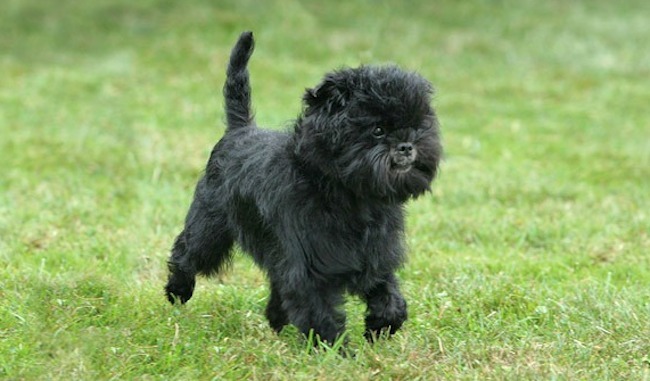 Gait: The Affenpinscher has a light, sound, balanced, confident gait and tends to carry itself with comic seriousness. When viewed from the front or rear while walking, the legs move parallel to each other. While trotting, the feet will converge toward a midline depending on the speed.